Mata Gujari Ji was married to Guru Tegh Bahadur Ji on 4 February 1633. Mata Gujri performed the humble duty of a devoted housewife and served her husband and mother-in-law. In 1655 the family left for east India to spread Sikhism and avoid intrigues of selfish and frustrated relatives. In July, 1675 Guru Tegh Bahadur was arrested for supporting the Pandits. He along with three companions was taken to Delhi for the supreme sacrifice. Mata Gujri showed great courage at the time of parting. During his absence, she slept on the floor, took food once a day, and prayed. She took the responsibility of managing the affairs as Gobind Rai was very young. She brought him up like a prince, arranged for his education, and military training. Thus she prepared him for the great mission ahead. When in face of a prolonged siege Anandpur had to be evacuated by Guru Gobind Singh Ji on the night of 5-6 December 1705, Mata Gujari with her younger grandsons, Zorawar Singh and Fateh Singh, aged nine and seven year respectively, was separated from the main body while crossing the Sirsa. The three of them were led by their servant, Gangu who treacherously betrayed them to the local Muslim officer. Mata Gujari and her grandsons were arrested on 8 December and confined in the Thanda Burj, the cold tower. As the children were summoned to appear in court from day to day, the grandmother kept urging them to remain steadfast in their faith. Mata Gujri foresaw what was going to happen to them. She advised her grandsons not to give up their faith under any circumstances. She told them how their grandfather, Guru Tegh Bahadur had sacrificed his life and preferred death to conversion. She also related to them the sacrifice of Guru Arjan Dev and prepared them to face the governor boldly and not to bow before him. She continued the tradition of Sikhism and without complaints gave her body singing guru ki Bani. Mata Gujari ji attained martyrdom the same day as her grandsons. Mata Gujari ji through upbringing of her grandsons played such an important role in Sikhism that as Sikhs, we can owe our existence to her. It was due to her teachings that 6 year old and 9 year old did not budge from their Dharma and attained martyrdom. Thus continuing and emphasizing the institute of martyrdom in Sikhism. Mata Gujri was the first Sikh Martyr lady in the Sikh history. She is also distinguished by being the wife of a martyr (Guru Tegh Bahaar), grandmother of four martyr Sahibzadas (Ajit Singh, Jujhar Singh, Zorawar Singh, and Fateh Singh), sister of a martyr ( Kirpal Chand) and aunt of five martyr sons of Bibi Viro, sister of Guru Tegh Bahadar. Mata Bhupinder Kaur Ji was the mother of, Sri Satguru Jagjit Singh Ji. 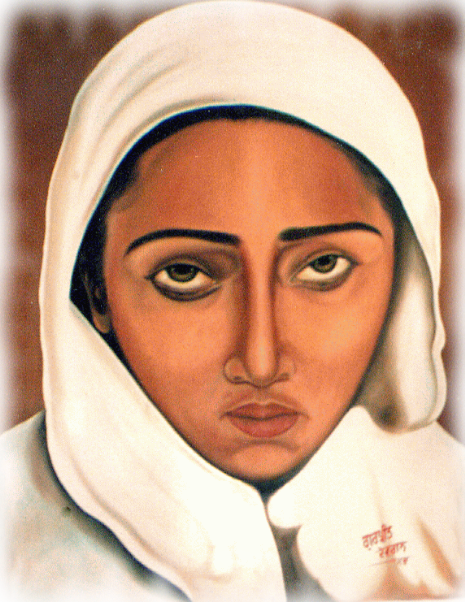 Mata Bhupinder Kaur ji was born in November of 1898 in the village of Gurusar near Dub-vali Abhor, in Punjab. Mata ji was the fifth born child to father Sunder Singh & mother Ram Kaur. She had 3 brothers and a sister. She was affectionately called Veero. It is said that in her childhood a sadhu predicted that she will one day become a jagat mata and that everyone should treat her with a lot of respect. By the age of 10yrs she had memorized all the 5 banis and had also done the entire paath of Adh Guru Granth Shaib Ji. She soon possessed all the characters of a guru-mata which are a personality enshrined with sewa, respect, gracefulness, natural beauty, humbleness, patience and modesty. Satguru Pratap Singh Ji was 24yrs old when He sat on the Gur-ga-dhee of Guru Nanak Dev Ji. On 22 December, at the age of 16yrs, Mata ji was married to Satguru Pratap Singh ji. Along with her daily life she did seva with her bare hands in Sri Bhaini Sahib. Once Satguru Ji was away from Sri Bhaini Sahib and Sant Mohan Singh Vadala & his jatha were camping along the river just outside Sri Bhaini Sahib. In a few days Sant Mohan Singh Ji's ration dwindled to almost nothing and requested Mata ji for provisions. Mata ji had no immediate funds at the time. She opened a trunk which contained her personal belongings and took out some gold ornaments, which she sold and provided the jatha with the langar for a few more days, till Satguru Ji returned back from the tour. On his return Satguru Pratap Singh heard about the incident and blessed Mata Ji. 88 years ago Mata Ji sought permission for women to take part in Jap Prayogs. In 1919, Mata ji asked Satguru Pratap Singh ji for permission to take part in the Jap Prayog. This was granted and all women joined Mata Ji for this annual Jap Tap. Since then women take an equal part in the Jap Prayogs. In November of 1920, the old sadhus prophecy finally become true and Mata Ji gave birth to Sri Satguru Jagjit Singh Ji in Sri Bhaini Sahib. In November of 1923, another son was born. After the birth of Maharaja Bir Singh Ji, Mata Ji's health did not recover and on 14 Sept she left for heavenly abode.